Farmers markets across the Carolinas are moving toward the main growing season, many still accepting applications for new vendors. Though there is never a true downtime in farming, winter encourages planning and review. This month’s Expert Tip encourages farmer vendors and markets themselves to consider food safety as an integral part of their process and design. National media coverage on foodborne disease outbreaks alerts all produce buyers about the potential hidden dangers of microbes on fresh produce and other market products. Area markets require each vendor to adhere to state health laws and acquire all necessary permits, so precautions are already being taken. However, assessing food safety risks is an ongoing responsibility for purveyors of fresh produce and demonstrating to customers that their health and safety is a top priority will continue to increase their loyalty to your market stand. Beyond that, we’re sharing a few new resources – a platform to help keep all your food safety T’s crossed and I’s dotted, a few new guides by the Organic Farming Research Foundation – oodles of cost-share opportunities to make GAP certification more accessible, as well as one for completing water analysis on your farm. And just for fun, here are some resources on grafting tomatoes and growing tomatoes in high tunnels if that’s part of your production. Enjoy field prep and spending time in your greenhouses! PS – Did you lose crops, livestock, equipment, or buildings in last year’s hurricanes? There’s still time to apply for a low-interest loan through CFSA’s RESEED Recovery Fund. In a nutshell, you can apply for any amount from $2,500 to $10,000, and the term of the loan is up to one year at 1% interest. Repayment of the loan is due in one lump sum at the end of the one-year term. Replacing damaged plants and livestock. Serving as bridge loans for future insurance payments or grants. 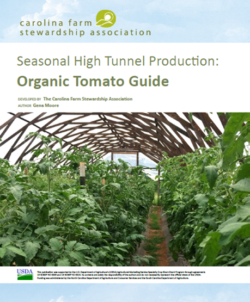 WANT HELP GETTING YOUR TUNNELS READY FOR SPRING PRODUCTION?